There many methods for getting rid of ants. However, not all ants are bad. They kill cockroaches, larvae of the filth fly, scale insects, mealybugs, some beetles and termites. It's a myth that there are more ants running around when it rains. The truth is ants multiply very quickly during dry, hot weather. Most people, if not all, don't want ants in their house or ravaging their garden. They especially don't want the stinging, red ants. But before you buy the ant spray, take a look at some home remedies that are better for the environment and your health. 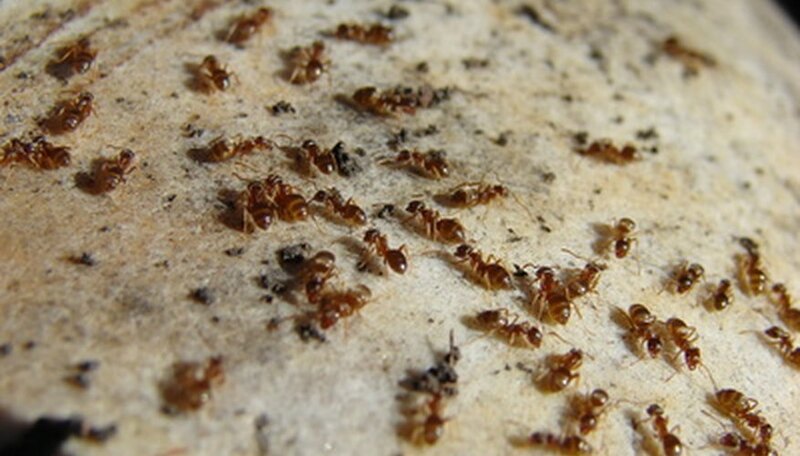 Don't let red ants set up housekeeping in the first place. Make sure there isn't any standing water near the house. Tie all trash up in plastic bags and keep the trash can lid shut tight. After the sanitation company picks up the trash for the week, hose out the can thoroughly and dry it in the sun. This gets rid of any lingering foodstuff or stickiness. If you feed your pets outside, pick up the bowls the second they're through eating. Scrub the bowls out with soapy water and dry them before setting them outside again. If you can find the red ant nest, kill the queen ant along with the colony and the problem is solved. Observe the traffic pattern of any red ants in the yard. The trail should lead you right to the nest. Now that you've found the nest, prepare 2 to 3 gallons of really hot water. It doesn't have to be boiling, but if it is you'll know for sure that it's hot enough. Pour it down the nest around noon to 1 p.m. This is when the queen ant is most active, increasing your chances of eliminating it. Repeat two or three times. Dr. Myles H. Bader, a medical doctor and certified preventive care practitioner, developed this recipe for eliminating ants in the garden: "Combine 2 tbsp. of flaked Ivory soap, 1 tbsp. Tabasco sauce, 5 drops of sesame seed oil, 5 drops of Jungle Rain into a 1 gallon spray bottle and shake to mix well. This can be sprayed directly on the ants or on their pathways. Keep away from children and pets." Ants hate mint. Plant some mint around the yard and the ants will move to the neighbor's garden. However, mint is very invasive. If you don't control its growth, you'll have a mint problem instead of an ant problem. The best way to do this is to plant the mint in coffee cans. Poke some holes in the bottom of coffee cans. Plant the mint in the can using good potting soil. If you like the smell and the way mint looks, plant a lot of it around the yard. That should permanently take care of the red ant problem. If you have coffee cans, you must also have coffee grounds. Ants don't like coffee either. Spread old coffee grounds around the garden. Cats hate them, but plants love coffee grounds and they're also good for the plants. Spread them on other parts of the yard where you have seen trails of ants, and pour them down the nest if you can find it.